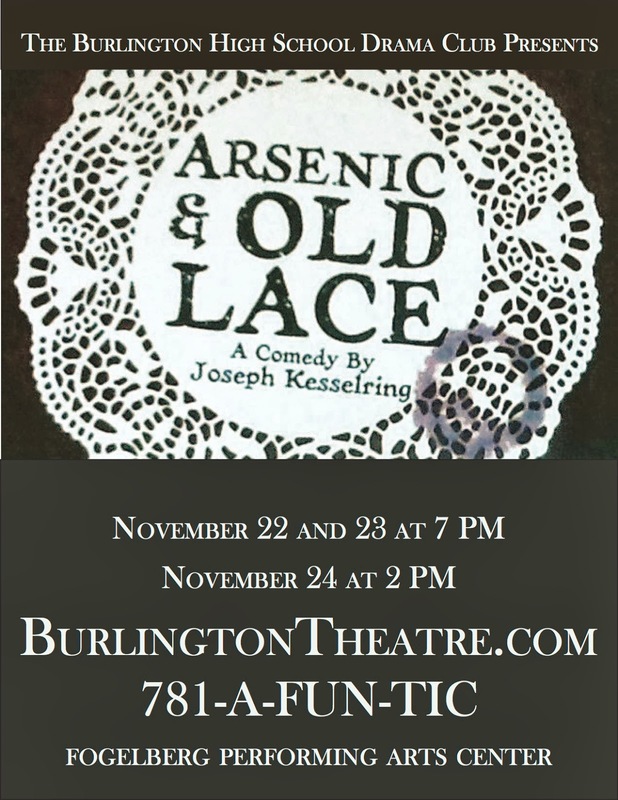 Burlington High School is pleased to announce it will present Joseph Kesselring’s madcap dark comedy, Arsenic and Old Lace, on November 22 and 23 at 7:00 pm, and November 24 at 2:00 pm, in the Fogelberg Performing Arts Center of the high school. The hilarious antics of Arsenic and Old Lace revolve around the Brewsters, an eccentric, frequently murderous and disturbed family. Family members include drama critic Mortimer Brewster who worries that his lovely fiancé Elaine Harper will not fit in with his dysfunctional family; spinster aunts Abby and Martha Brewster who have a penchant for relieving the loneliness of old men with poison-laced elderberry wine despite the fact they are known throughout Brooklyn for their many acts of charitable kindness; a brother who is “touched” and believes he is Teddy Roosevelt; and another murderous brother who has had plastic surgery to conceal his identity and comes out looking like Boris Karloff! Leading the cast of Arsenic and Old Lace are Andrew Kolifrath as Mortimer Brewster, Laura Frustac as Abby Brewster, Rachel Seeley as Martha Brewster, Mike Garcia as Jonathan Brewster, Harrison Lane as Teddy Brewster and Brooke Hindle as Elaine Harper. Also appearing in the cast are TJ Horgan as The Rev. Dr. Harper, Xavier Little as Officer Brophy, Jonathan Chellali as Officer Klein, Kevin McGrath as Mister Gibbs, Timmy Sullivan as Dr. Einstein, Patrick Hoarty as Officer O’Hara, Tommy Bezreh as Lt. Rooney and Nicholas Compagna as Mister Witherspoon. Executive producer John Middleton-Cox leads the production staff comprised of Peter Waldren as set designer/master carpenter and Maureen Krebs as costume designer. BHS students pick up the technical staff positions with Tim Maiorana as stage manager, Paul Terranova as assistant stage manager, Joe Sateriale as lighting technician and Rachel Merullo as sound technician. 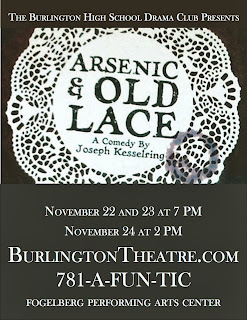 Tickets for Arsenic and Old Lace are $10 for adults, $5 for students and senior citizens, and are available online at www.BurlingtonTheatre.com or by phone at 781-A-FUN-TIC. The Fogelberg Performing Arts Center is handicapped accessible and located at 123 Cambridge Street, Burlington, MA.